Tilden Township, PA – Home of the largest and most successful Cabela's Worlds Foremost Outfitter store in the nation, is about to become home to another large commercial project. 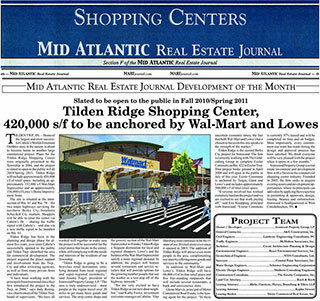 Plans for the Tilden Ridge Shopping Center were originally presented to the Township in 2004 and the project is slated to open to the public in Spring 2011 including approximately 420,000 sf of retail space. "Tilden Ridge is going to be a first class retail destination, satisfying demand from local, regional and super-regional customers," said Jeremy Fogel, president of Ironwood Property Group, LP. "We are very excited to have Tilden Ridge as our next door neighbor," said Kathy Foster, investment real estate manager at Cabelas. "Our Hamburg store continues to be the #1 store of our 30 retail stores ever since it opened in 2003." Tilden Ridge is the second Berks County project for Ironwood. The firm is currently working with the Goldenberg Group to complete Exeter Commons on Rte 422 in Exeter Twp, also design by CREATE. "Everyone involved has worked extremely hard on the project and we are excited to see that work paying off," said Eric Knopping, principal with Ironwood.